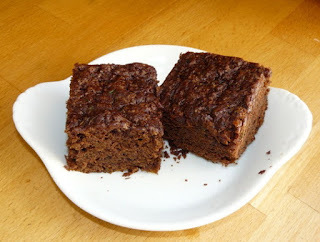 Here is my favourite brownie recipe, traditionally made in summer when the courgettes are taking over the kitchen and I find myself adding them to everything I make. However with the gloom of wet February days I needed a chocolate fix so made a few changes using carrot with orange zest for an equally delicious moist treat and then carrot with zingy fresh ginger – well it has been really wet here! In a large bowl, mix together oils, sugar and vanilla until well blended. Combine flour, cocoa powder, bicarb and salt; stir into sugar mixture. Fold in courgettes, walnuts and wine. Note it is a rather dry mixture. Spread evenly in prepared tin. Bake for 25 to 30 mins, until it springs back when gently touched. Allow to cool before cutting into squares. I have made carrot cake before but had never thought about courgettes in cake. I expect they keep it really moist. Kerry I feel courgettes magically enhance any dish you put them in, but I'm a bit of a courgette nut! But yes, just like carrot they add a moistness and texture, you don't taste them at all.